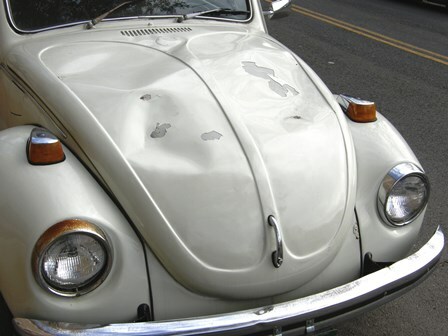 If your car got caught in one of this year’s dramatic hail storm it’s time to consider how you want it repaired. Because, yes, there are different methods for undoing dents. For a few decades now, body shops have been using paintless dent repair or paintless dent removal (PDR). Conventional dent repair pulls the dent up from the outside by welding a rod to the dent. Then the rod has to be ground off, the spot has to be filled (as with bondo, for example), sanded and painted over. As opposed to conventional dent repair, PDR typically attempts to reach the dent from underneath and push it out. This involves removing certain pieces of the interior, when it’s reasonable to do so. PDR can also involve setting up a bar over the dent, gluing a tab to the dent and pulling it out. The risk in both methods is that the sheet metal may not magically return to its original flawless form. If your car is a candidate for PDR, you need to vet your repairman. After hailstorms, teams of out-of-town mobile PDR “technicians” are known to flock to the afflicted locations, offering quick and cheap fixes. It’s wiser to go with an established, local shop (like Great Plains Auto Body) who will still be in business if you need any follow-up.